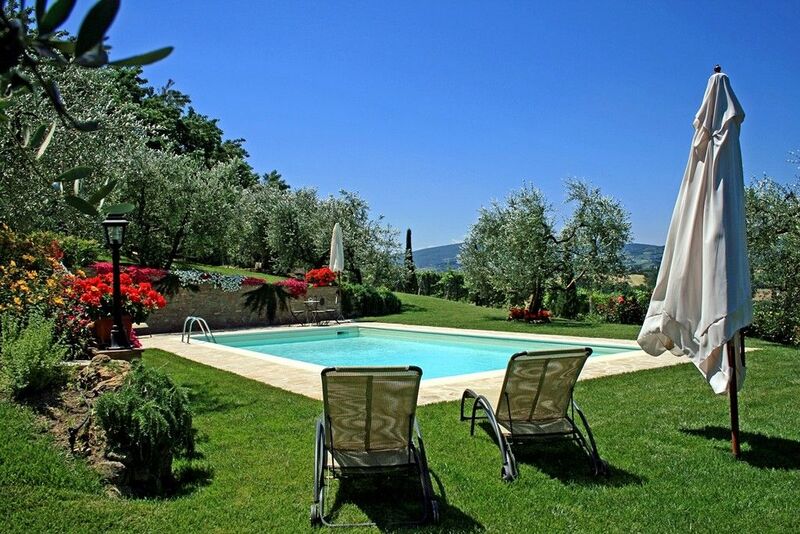 Charming stone-built house located in a peaceful and panoramic position on the green, rolling hills near San Gimignano. The villa is the result of a recent renovation which has transformed this ancient barn into a beautiful and comfortable detached villa, ideal for spending a relaxing holiday in the very heart of Tuscany. Internally the house offers comfortable and cosy rooms, is well furnished in rustic style and provided with all modern facilities such as sat. TV, CD/DVD player, Wi-Fi internet access, dishwasher & washing machine, microwave oven, espresso coffee maker, air conditioning, central heating, etc. The house, completely enclosed, is provided with a private swimming pool (5x10 m. - depth 1,20-1,60 m.) available from April to October set in an olive grove with nice panoramic view over the countryside. The property is very centrally situated for visiting the most renowned historical and art centres in Tuscany as well as many other smaller characteristic villages in the Chianti region, and within easy reach of the 'Siena - Florence' dual carriageway (8 km). Essential services (food shop and restaurant) are available in the nearby village of Ulignano (1.800 meters), whilst all kinds of services (supermarkets, banks, railway station, horse riding, tennis, etc.) can be found in the close town of Poggibonsi (8 km). Some distances: San Gimignano 9 km, Colle Val d’Elsa (Golf Club) 15 km, Siena 30 km, Volterra 35 km, Florence 40 km, Pisa 80 km, Cecina (beaches) 85 km, Rome 270 km. Groundfloor: living / dining room with fireplace, double sofa bed and sat TV, fully equipped kitchen,1 double bedroom, 1 twin bedroom, 1 bathroom with shower. Furnished terrace. This is our second visit to this cottage. The location is great - just ten minutes to San Gimignano, and 25 minutes to Siena. The gardens are immaculately maintained - the photos are a true reflection. The views from the garden are excellent. The owner is very generous, providing all of the necessities when arriving (including wine and his own olive oil!). The owner did not bother us at all during the stay. I would highly recommend this house if visiting central Tuscany. We had a fantastic week at Brunello. The accommodation was clean, comfortable, well equipped and well maintained. The pool and pool area are fabulous .. the views are stunning, there are comfortable loungers and chairs and the pool area is quite private / secluded. We also enjoyed the warm welcome from Brunello and Ilaria when we arrived. The accommodation is cozy (decorated quite traditionally and not huge) which suited us perfectly (a family with two kids <10). It is truly with great pleasure that we read your positive comments, your satisfaction is truly our greatest reward! Wir haben eine sehr schöne Woche in der Villa Brunello genossen. Es war alles im Haus vorhanden - alles, was wir aus Deutschland mitgebracht hatten, konnten wir im Koffer lassen, da Herr Brunello wirklich an alles gedacht hat. Wir wurden ganz herzlich empfangen und bekamen gleich Geschenke in Form von Wein, Olivenöl und Mandelbrot - echt toll! Das Haus ist sehr sauber und gepflegt. Herr Brunello, ein wirklich ganz lieber Mensch, kam jeden Morgen auf das Grundstück, um alles zu pflegen. Es wurde gegossen, Pool gereinigt, geputzt - und alles so, dass wir nichts davon mitbekommen haben. Er war stets für unsere Fragen offen. Als wir dann noch eine Panne mit unserem Fahrzeug hatten, fuhr uns Herr Brunello ohne lange zu zögern in den nächsten Supermarkt, damit wir uns mit Lebensmittel versorgen konnten. Ein wirklich empfehlenswertes Objekt! Wir waren schon oft in der Toskana, haben aber noch nie ein gepflegteres und besser ausgestattetes Haus vorgefunden. Wir kommen irgendwann sicher wieder! This charming cottage is a perfect located property in the Tuscan countryside with a stunning view. San Gimignano and Certaldo are both 9km from the location and has good restaurants. The location of the cottage is very peaceful and quiet and has a beutiful garden with hundreds of flowers and a private pool. The property is very clean and has a private parking. Das Haus hat eine tolle Lage mit schönem Ausblick auf die Weinberge. San Gimignano, Florenz und Siena sind mit dem Pkw schnell zu erreichen. Der Vermieter kümmert sich sehr, reinigt jeden Morgen den Pool und hat sogar den Grill gesäubert ( was wir auch selber gemacht hätten), die Familie ist sehr nett und es lief alles reibungslos ab. Sollte es nochmal in die Toskana gehen, werden wir dort wieder buchen! The region is located in the central, western part of the country, north of Rome and south of Genoa. It is bounded by the Apennine Mountains to the North and East, the Apuan Alps on the north west and by the Tyrrhenian Sea on the West. From the Etruscan to the Romans to the Renaissance, Tuscany is possibly the greatest repository of art in the world, from extraordinary paintings and sculpture to frescoes and architectural masterpieces. Tuscany: a row of cypress trees breaking the blue sky on a rolling hilltop. Olive groves and grapevines marching tidily down the side of a slope. Little medieval hill towns gazing down upon a country that has been carefully cultivated. The Chianti area, between Florence and Siena, is one of the most beautiful countrysides in Italy and a famous wine production area. San Gimignano rises on a hill (334m high) dominating the Elsa Valley with its towers. The town increased in wealth and developed greatly during the Middle Ages.